In his Notes on the State of Virginia (1785), Thomas Jefferson defended American Indian culture and marveled at how the tribes of Virginia "never submitted themselves to any laws, any coercive power, any shadow of government" due to their "moral sense of right and wrong". He would later write to the Marquis de Chastellux in 1785, "I believe the Indian then to be in body and mind equal to the whiteman". His desire, as interpreted by Francis Paul Prucha, was for the Native Americans to intermix with European Americans and to become one people. To achieve that end, Jefferson would, as President, offer U.S. citizenship to some Indian nations, and propose offering credit to them to facilitate their trade—with the expectation, as Bernard Sheehan argues, that they would be unable to honor their debts and thereby allow the United States to acquire their land. In 1795, in his Seventh Annual Message to Congress, Washington intimated that if the U.S. government wanted peace with the Indians, then it must give peace to them, and that if the U.S. wanted raids by Indians to stop, then raids by American "frontier inhabitants" must also stop. The Confederation Congress passed the Northwest Ordinance of 1787, which would serve broadly as a precedent for the manner in which the United States' territorial expansion would occur for years to come, calling for the protection of Indians' "property, rights, and liberty": The U.S. Constitution of 1787 (Article I, Section 8) makes Congress responsible for regulating commerce with the Indian tribes. In 1790, the new U.S. Congress passed the Indian Nonintercourse Act (renewed and amended in 1793, 1796, 1799, 1802, and 1834) to protect and codify the land rights of recognized tribes. As president, Thomas Jefferson developed a far-reaching Indian policy that had two primary goals. First, the security of the new United States was paramount, so Jefferson wanted to assure that the Native nations were tightly bound to the United States, and not other foreign nations. Second, he wanted "to civilize" them into adopting an agricultural, rather than a hunter-gatherer lifestyle. These goals would be achieved through the development of trade and the signing of treaties. Under President James Monroe, Secretary of War John C. Calhoun devised the first plans for Indian removal. By late 1824, Monroe approved Calhoun's plans and in a special message to the Senate on January 27, 1825, requested the creation of the Arkansaw Territory and Indian Territory. The Indians east of the Mississippi were to voluntarily exchange their lands for lands west of the river. The Senate accepted Monroe's request and asked Calhoun to draft a bill, which was killed in the House of Representatives by the Georgia delegation. President John Quincy Adams assumed the Calhoun–Monroe policy and was determined to remove the Indians by non-forceful means, but Georgia refused to submit to Adams' request, forcing Adams to make a treaty with the Cherokees granting Georgia the Cherokee lands. On July 26, 1827, the Cherokee Nation adopted a written constitution modeled after that of the United States which declared they were an independent nation with jurisdiction over their own lands. Georgia contended that it would not countenance a sovereign state within its own territory, and proceeded to assert its authority over Cherokee territory. When Andrew Jackson became president as the candidate of the newly organized Democratic Party, he agreed that the Indians should be forced to exchange their eastern lands for western lands and relocate to them, and enforced Indian removal policy vigorously. When Andrew Jackson assumed office as president of the United States in 1829, his government took a hard line on Indian Removal policy. Jackson abandoned the policy of his predecessors of treating different Indian groups as separate nations. Instead, he aggressively pursued plans against all Indian tribes which claimed constitutional sovereignty and independence from state laws, and which were based east of the Mississippi River. They were to be removed to reservations in Indian Territory west of the Mississippi (now Oklahoma), where their laws could be sovereign without any state interference. At Jackson's request, the United States Congress opened a debate on an Indian Removal Bill. After fierce disagreements, the Senate passed the measure 28–19, the House 102–97. Jackson signed the legislation into law May 30, 1830. 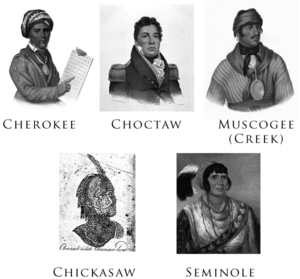 In 1830, the majority of the "Five Civilized Tribes"—the Chickasaw, Choctaw, Creek, Seminole, and Cherokee—were living east of the Mississippi. The Indian Removal Act of 1830 implemented the federal government's policy towards the Indian populations, which called for moving Native American tribes living east of the Mississippi River to lands west of the river. While it did not authorize the forced removal of the indigenous tribes, it authorized the President to negotiate land exchange treaties with tribes located in lands of the United States. The Marshall court heard the case in Cherokee Nation v. Georgia (1831), but declined to rule on its merits, instead declaring that the Native American tribes were not sovereign nations, and had no status to "maintain an action" in the courts of the United States. In Worcester v. Georgia (1832), the court held, in an opinion written by Chief Justice Marshall, that individual states had no authority in American Indian affairs. By the terms of the Second Treaty of Buffalo Creek (1838), the Senecas transferred all their land in New York, excepting one small reservation, in exchange for 200,000 acres of land in Indian Territory. The U.S. federal government would be responsible for the removal of those Senecas who opted to go west, while the Ogden Land company would acquire their lands in New York. The lands were sold by government officials, however, and the money deposited in the U.S. Treasury. The Senecas asserted that they had been defrauded, and sued for redress in the U.S. Court of Claims. The case was not resolved until 1898, when the United States awarded $1,998,714.46 in compensation to "the New York Indians". In 1842 and 1857, the U.S. signed treaties with the Senecas and the Tonawanda Senecas, respectively. Under the treaty of 1857, the Tonawandas renounced all claim to lands west of the Mississippi in exchange for the right to buy back the lands of the Tonawanda reservation from the Ogden Land Company. Over a century later, the Senecas purchased a nine-acre plot (part of their original reservation) in downtown Buffalo to build the "Seneca Buffalo Creek Casino". Historical views regarding the Indian Removal have been re-evaluated since that time. Widespread acceptance at the time of the policy, due in part to an embracing of the concept of Manifest destiny by the general populace, have since given way to somewhat harsher views. Descriptions such as "paternalism", ethnic cleansing, and even genocide have been ascribed by historians past and present to the motivation behind the Removals. Andrew Jackson's reputation took a blow for his treatment of the Indians. Historians who admire Jackson's strong presidential leadership, such as Arthur Schlesinger, Jr., would skip over the Indian question with a footnote. Writing in 1969, Francis Paul Prucha argued that Jackson's removal of the Five Civilized Tribes from the very hostile white environment in the Old South to Oklahoma probably saved their very existence. In the 1970s, however, Jackson came under sharp attack from writers, such as Michael Paul Rogin and Howard Zinn, chiefly on this issue. Zinn called him "exterminator of Indians"; Paul R. Bartrop and Steven Leonard Jacobs argue that Jackson's policies did not meet the criterion for genocide or cultural genocide. ^ William G. McLoughlin (Spring 1981). "Experiment in Cherokee Citizenship, 1817-1829". American Quarterly. 33 (1): 3–25. doi:10.2307/2712531. JSTOR 2712531. ^ a b Kane, Sharyn & Keeton, Richard (1994). "As Long as Grass Grows [Ch. 11]". Fort Benning: The Land and the People. Fort Benning, GA and Tallahassee, FL: U.S. Army Infantry Center, Directorate of Public Works, Environmental Management Division, and National Park Service, Southeast Archaeological Center. pp. 95–104. ASIN B000QQX5IC. OCLC 39804148. Archived from the original on August 17, 2007. Retrieved March 7, 2017. CS1 maint: Uses authors parameter (link) CS1 maint: BOT: original-url status unknown (link) The work is also available from the U.S. Army, as a Benning History/Fort Benning the Land and the People.pdf PDF. ^ John P. Bowes (2014). "American Indian Removal beyond the Removal Act". Wicazo Sa Review. 1 (1): 65. doi:10.5749/natiindistudj.1.1.0065. ISSN 0749-6427.